” The available data on Aboriginal and Torres Strait Islander disadvantage has shone a light on the Indigenous mental health and wellbeing gap. We acknowledge the Traditional Owners of the land across Australia and pay our respect to the Elders past, present and future. We also acknowledge young people as they are our future leaders, the custodians of our stories, cultures, histories and languages. 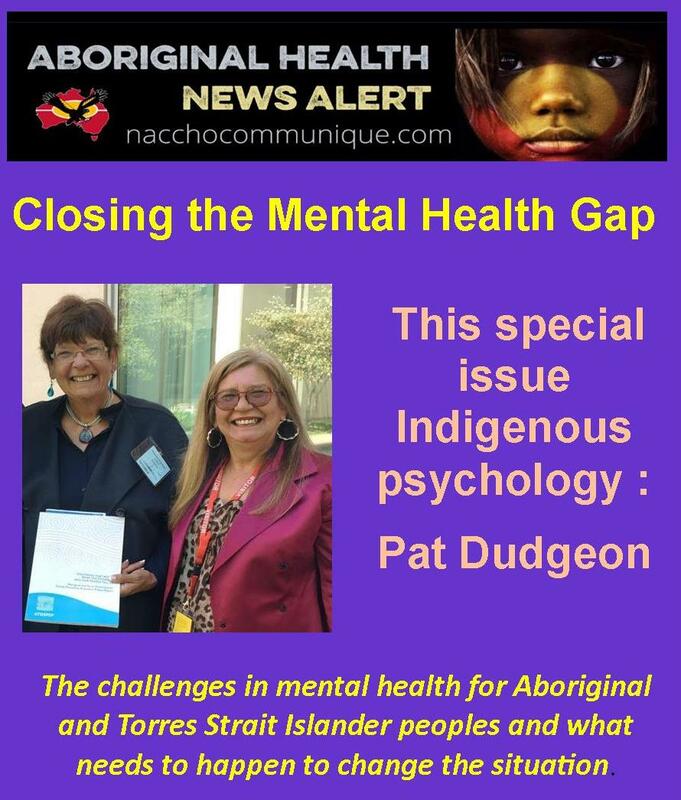 We as seniors must create opportunities and encourage our youth to realise their full potential (Calma, 2015).This special issue on Indigenous psychology is timely in a changing landscape for Aboriginal and Torres Strait Islander (hereon Indigenous) people and their participation in an Australian nationhood. A range of significant landmark events suggests that both Aboriginal and Torres Strait Islander people and Australians are in a process of decolonisation. In our first special issue of Australian Psychologist: Indigenous Australian Psychologies (2000), we marked the changes that were taking place and our hopes for a better future. Here our focus was on psychology, Indigenous issues, and reconciliation. Looking back to that time 17 years ago, Aboriginal and Torres Strait Islander affairs have clearly advanced.As a result of the work of Indigenous communities, their leaders, and social justice advocates, there is now a greater public awareness of the social and cultural determinants of Indigenous health and a range of government policies and actions aimed at closing the health and life expectancy gap between the Indigenous peoples of the land and other Australians.In his role as the Aboriginal and Torres Strait Islander Social Justice Commissioner, Professor Tom Calma released a landmark document, the Social Justice Report (2005).This called for the nation to commit to achieving health equality for Indigenous people by 2030, and saw the establishment of the Close the Gap campaign in 2007.Dialogues about the underlying and deeply entrenched socio-economic disadvantage that contributes to this gap are now part of the national dialogue. Government policies and action to close the gap have also now become a national priority that is annually reviewed.This year, the Prime Minster presented the ninth annual report card to Parliament (Closing the Gap Prime Minister’s Report, 2017).Notably, Indigenous mental health and suicide prevention is highlighted as a priority in this report, which is acknowledged by all Australian governments. The available data on Aboriginal and Torres Strait Islander disadvantage has shone a light on the Indigenous mental health and wellbeing gap. In their commentary in this special issue, Calma, Dudgeon, and Bray (2017) provide details of the challenges in mental health for Aboriginal and Torres Strait Islander peoples and what needs to happen to change the situation. All articles in this issue are concerned with and aimed at contributing to closing the mental health gap. For example, in Addressing the Mental Health Gap in Working with Indigenous Youth: Some Considerations for non-Indigenous Psychologists Working with Indigenous Youth (Ralph & Ryan, 2017), an overview of therapeutic approaches with Aboriginal and Torres Strait Islander people, particularly youth, is provided. The SEWB of Aboriginal and Torres Strait Islander youth is also the focus of Using Culturally Appropriate Approaches to the Development of KidsMatter Resources to Support the Social and Emotional Wellbeing of Aboriginal Children (Smith, O’Grady, Cubillo, & Cavanagh, 2017). In this article, Smith, O’Grady, Cubillo, and Cavanagh (2017) describe the methodology behind the development of resources in the KidsMatter Aboriginal Children’s Social and Emotional Wellbeing Project. An inclusive process of workshops and consultations with Aboriginal people was informed by participatory action, narrative therapy, and critically reflexive practice. This process enabled researchers and the community to build effective learning tools for children for use by Aboriginal families, schools, and early childhood and health and community services. Another article in this special issue, Narratives of Twitter as a Platform for Professional Development, Innovation and Advocacy (Geia, Pearson, & Sweet, 2017) offers a compelling argument for the online engagement of psychologists—both Indigenous and non-Indigenous—in raising community awareness of strategies for decolonisation, for circulating empowering, strength-based approaches to Indigenous wellbeing, and supporting and recruiting potential practitioners. This paper describes the significant success of some transformative Indigenous Twitter movements. Lynore Geia, a Bwgcolman woman from Palm Island in Queensland, discusses #IHMayDay the day long Twitter festival raising awareness of health issues; Luke Pearson, a Gamilaroi man, describes how he set up @IndigenousX and the subsequent global and local impact on healing and knowledge building, and Melissa Sweet discusses the important #JustJustice campaign. The connections between the criminal justice system and SEWB are also focused on in a significant paper on the urgent need for justice reinvestment, Keeping on Country: Understanding and Responding to Crime and recidivism in Remote Indigenous Communities (Dawes, Davidson, Walden, & Isaacs, 2017). Outcomes from a qualitative study using a multidisciplinary research team that engaged the community through a specific participatory action research process are discussed. Their findings resonate with the principles of justice reinvestment; Dawes, Davidson, Walden and Isaacs (2017) suggest that with the right methodological approach Indigenous communities themselves can easily identify the underlying factors contributing to crime. With the community, localised strategies to address over-representation in the justice system can be developed. Further, adopting a self-determination approach provides a strength-based position for psychologists working in the area. Cross-cultural understanding and developing and maintaining local culture in remote communities is the focus of another unique article, The Uti Kulintjaku Project: The Path to Clear Thinking. An Evaluation of an Innovative, Aboriginal-led Approach to Developing Bi-cultural Understanding of Mental Health and Wellbeing (2017). The results of 3 years of research was an innovative approach to strengthen shared understandings in mental health. The research work undertaken is at the heart of cross-cultural relationships, that is, exploring and articulating deep understandings of language and concepts. Both the community leaders and the non-Indigenous workers in the research team have benefited from this appropriately long-term project. The importance of recognising the contributions of Indigenous concepts of SEWB is also the focus of Decolonising Psychology: Validating Social and Emotional Wellbeing (Dudgeon, Bray & D’Costa, Walker, 2017) which uses findings from the National Empowerment Project to explore the seven domains of SEWB, namely body, mind and emotions, family, community, culture, Country, and spirituality. In this article, Dudgeon, Bray, D’Costa, and Walker (2017) highlight how SEWB, (an emerging concept within Indigenous psychology), is important in holistically addressing the well being needs of Indigenous people. The breadth of topics and approaches of the articles in this special issue are a testament to the strong emergence of Australian Indigenous psychology and are just some of the numerous innovations being made in the field across the nation. New methodologies, important findings, strategies for research futures, and guides for practitioners are offered. Each paper makes a significant contribution to both the discipline, the project of Indigenous social justice, and closing the mental health gap. A reaction against the colonisation/hegemony of Western psychology. The need for non-Western cultures to solve their local problems—Indigenous practices and applications. The need for a non-Western culture to recognise itself in the constructs and practices of psychology. The need to use Indigenous philosophies and concepts to generate theories of global discourse. We address each of these factors below; however, it is noted that implicit within these is a recognition that the principle of self-determination, confirmed as an underlying principle in the United Nations Declaration of the Rights of Indigenous People (UNDRIP) (2007), is central to wellbeing and the survival of cultural rights. Specifically, there are provisions regarding obligations to respect, recognise, and uphold Indigenous peoples’ individual and collective rights to develop, maintain, and use their own health systems, institutional structures, distinctive customs, spirituality, traditions, procedures, and practices in pursuit of their right to health and mental health and wellbeing. Authors such as Dudgeon and Walker (2015) have examined this relationship in other papers. The measured and principled response of Australia Indigenous psychology to the colonising impacts of Western psychology has challenged the discipline to re-think foundational assumptions. Since the 1990s Indigenous psychologies across the world have illuminated the ways in which Western therapeutic paradigms have privileged a concept of individual mental health. In short, the normalisation of Western individualism has reduced our understanding of psychological distress and healing. Indigenous therapeutic knowledge about the self as a dynamic flow of connections have until quite recently been silenced, and even pathologised. Yet gains in the discipline over the last few decades have seen a shift from Indigenous people being framed as objects of research to being agents of meaning and transformation. The marginalisation of Indigenous psychological research within the academy is still, however, an issue which requires change. There is a broad consensus across Australian Indigenous communities that culturally strong therapeutic knowledge and practices are ones which articulate solutions identified by local communities (Dudgeon et al., 2014). Respect for the cultural knowledge of Elders is also important in the capacity building of on-country healing programs aimed at reducing youth suicide and “highlight the need for continued support for Elders in maintaining and passing on their cultural knowledge to young people” (Solutions That Work: What the Evidence and Our People Tell Us, 2016, p. 22). This form of recognition is foundational to the process of decolonisation and for communities to identity their own solutions and articulate their own cultural concepts. However, it is equally important for Western psychology to recognise how the discipline has constructed Indigenous subjectivity and practiced culturally inappropriate therapeutic interventions. In this respect, the Australian Psychological Society has made history by being the first to formally apologise to Indigenous peoples for past oppressive practices and to vow to make systemic changes. The 2016 people was made at the Australian Psychological Society Congress 2016 in Melbourne. 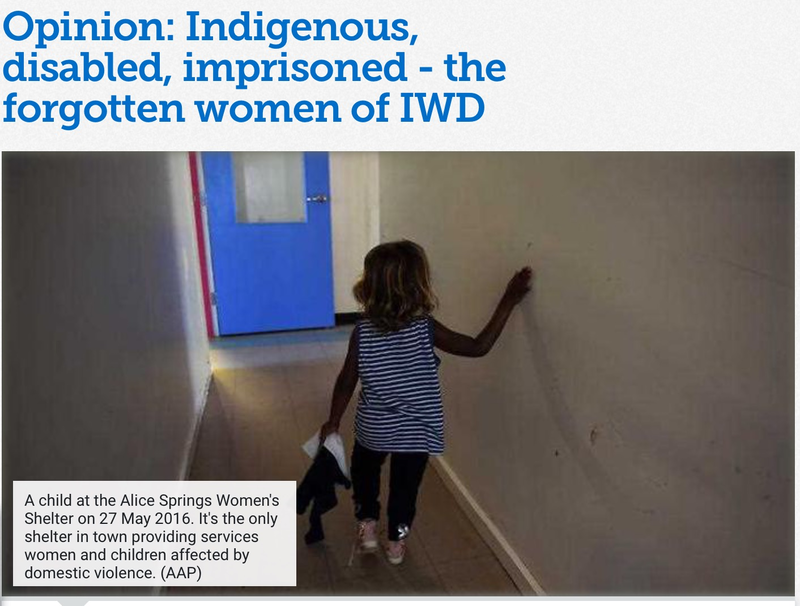 This has become a significant event that gained considerable worldwide media attention and has impact not only in Australia but internationally, with the American Psychological Association now developing a similar apology to their Indigenous people. It is fitting that those involved with progressing the APS apology comment in this special edition. Carey et al. provide a brief overview of the APS’s involvement with Aboriginal and Torres Strait Islander people and issues, tracing the history that contextualises the apology. The apology, how it came about and the reaction to it, particularly by APS members, describes a changing discipline. Following the Australian Government’s landmark apology to Aboriginal and Torres Strait Islander people Stolen Generations in 2008, the APS apology speaks to a maturing sense of race relations and nationhood. In my opinion, the apology formally owns and acknowledges the wrongs done, and the denial of the past, the injustice and oppression that was the lot of many Aboriginal and Torres Strait Islander people. In some respects, Aboriginal and Torres Strait Islander people have suffered a double burden—of suffering injustice and also of having that suffering denied. The apology from the nation and the APS is important; they value people and their experiences and give people respect and a genuine presence. A shared journey of healing for us as a nation can progress. There is a growing recognition of how psychology has been complicit in the processes of colonisation and oppressing Indigenous peoples. Recognising and acknowledging this past is important, hence the importance of the APS apology. Such acknowledgement and apology allows us to move forward, acknowledging colonisation allows decolonisation for both groups and into a more advanced discipline. It allows space for other viewpoints and understandings to emerge that not only benefit Indigenous peoples but all Australians. There is reason for optimism and the potential for empowerment and genuine inclusion of Aboriginal peoples in the discipline. In order to decolonise psychology in Australia, the discipline needs to consider and incorporate Aboriginal culture and beliefs into mental health services and research. We see this happening from the papers in this special edition. There is focus on the development of Aboriginal paradigms, standpoints, and concepts such as social and emotional wellbeing. Further, there is a deep appreciation of cultural difference and a willingness to work to develop mutual understandings. The papers in the special edition show the promise of different approaches and the development of a new phase of Australian psychology. ‘Self determination’, ‘quality of life’, ‘wellbeing’: these are terms that have only recently entered the vocabulary of mental health professionals working in indigenous settings. They are unfamiliar and handled with uncertainty and, at times, temerity; they are also unavoidable (1997, p. 821). This special issue attests to how such terms are now a common part of discussions about Aboriginal and Torres Strait Islander wellbeing, and part of a vanguard movement in psychology. Such terms have a substantial material force and a political history, as well as being part of the discourse of Indigenous psychology. Globally, the focus on decolonisation has emerged as a new defining movement which is in the process of transforming all disciplines, not only psychology. Decades of complex Indigenous struggles, debates, and victories are driving decolonisation, and it is because of this that terms such as “self-determination” and “wellbeing” resonate with a particular historical dignity. The Aboriginal and Torres Strait Islander mental health movement is decolonising the discourse of Australian mental health not only within specialised journals but within the public sphere through the opening up of national debates about the relationship between racism and wellbeing. In doing so, the movement has also contributed to the national projects of overcoming racism and de-stigmatising psychological distress by providing insights into the social and cultural determinants of mental health. Aboriginal and Torres Strait Islander peoples retain distinct cultural identities whether they live in urban, regional or remote areas of Australia. The word ‘peoples’ recognises that Aborigines and Torres Strait Islanders have a collective, rather than purely individual, dimension to their lives. This is affirmed by the United Nations Declaration on the Rights of Indigenous Peoples (2012, p. 6). ” The poorer mental health of remote and rural Indigenous Australians is also impacted by the social determinants of Indigenous health, which are well recognised nationally and internationally. The relationship of remoteness to health is particularly important for Indigenous Australians, who are overrepresented in remote and rural Australia (Australian Institute of Health and Welfare, 2014a). Narrative therapy taps into the centuries-old tradition among Aboriginal people of story-telling and expression through art. At the family Urapuntja Clinic, both women and children take part in narrative therapy. They recreate what is commonly seen on any given evening in an Aboriginal community—people sitting around the fire, relating to one another and telling stories. Lynne Henderson, former RFDS Central Operations mental health clinician. Mental health disorders are not more common in rural and regional Australia than they are in Australia’s cities, according to a new report from the Royal Flying Doctor Service (RFDS), but they are a lot harder to treat. The report, Mental Health in Remote and Rural Communities, found about one in five remote and rural Australians — 960,000 people — experience mental illness. But a combination of lack of access to facilities, social stigma, and cultural barriers present challenges to getting people the help they need. AHCRA believes that’s something that everyone should be concerned about, with access to care regardless of location. Data from the 2011 Australian Census demonstrated that 669,881 Australians, or 3% of the population, identified as Indigenous (Australian Bureau of Statistics, 2013b), and that 142,900 Indigenous Australians, or 21% of the Indigenous population, lived in remote and very remote areas (Australian Institute of Aboriginal and Torres Strait Islander Studies, 2014). 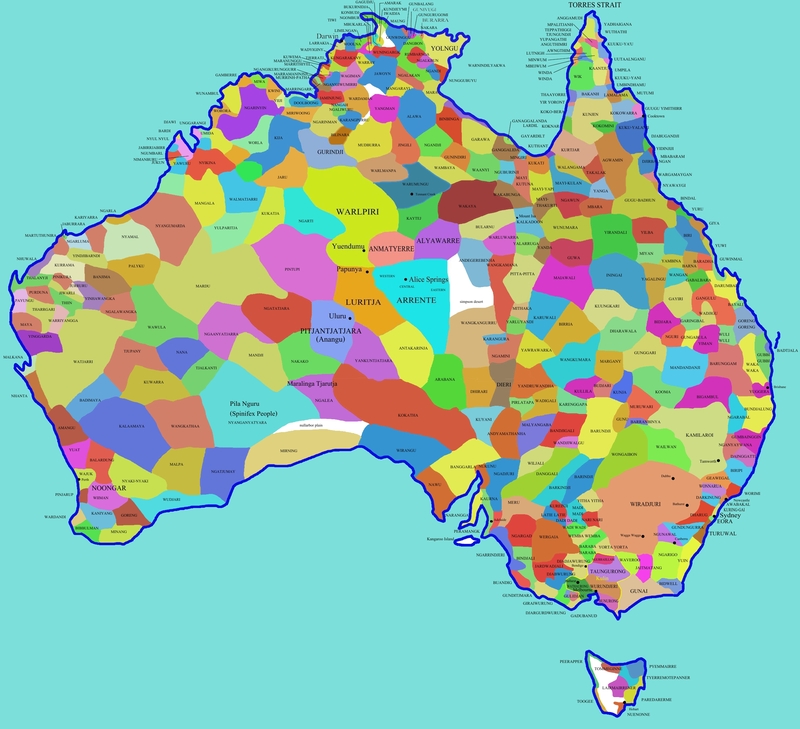 Around 45% of people in very remote Australia (91,600 people), and 16% of people in remote Australia (51,300 people) were Indigenous (Australian Bureau of Statistics, 2013b; Australian Institute of Aboriginal and Torres Strait Islander Studies, 2014). In 2011–2012 around one-third (30%) of Indigenous adults reported high or very high levels of psychological distress—almost three times the rate for non-Indigenous Australians (Australian Bureau of Statistics, 2014). 2015a). Specifically, age-standardised death data demonstrated that Indigenous Australians (49 per 100,000 population) were 1.2 times as likely as non-Indigenous Australians (40 per 100,000 population) to die from mental and behavioural disorders (Australian Institute of Health and Welfare, 2015a). Age-standardised deaths from mental and behavioural disorders increased with increasing age in both Indigenous and non-Indigenous Australians in 2008–2012. Welfare, 2015a). In 2008–2012, Indigenous Australians (14.7 per 100,000 population) aged 45–54 years were 4.9 times as likely as non-Indigenous Australians (3.0 per 100,000 population) to die from mental and behavioural disorders (Australian Institute of Health and Welfare, 2015a). as non-Indigenous Australians (31.3 per 100,000 population) to die from mental and behavioural disorders (Australian Institute of Health and Welfare, 2015a). Further exploration of death data from mental and behavioural disorders illustrates the significant impact of psychoactive substance use (ICD-10-AM codes F10–F19) on Indigenous mortality (Australian Institute of Health and Welfare, 2015a). In 2008–2012, 29.1% of Indigenous deaths due to mental and behavioural disorders were the result of psychoactive substance use, such as alcohol, opioids, cannabinoids, sedative hypnotics, cocaine, other stimulants such as caffeine, hallucinogens, tobacco, volatile solvents, or multiple drug use. During this period, Indigenous Australians (7.3 per 100,000 populations) were 4.8 times as likely as non-Indigenous Australians to die as a result of psychoactive substance use (Australian Institute of Health and Welfare, 2015a). Similarly, in 2006–2010, there were 312 Indigenous deaths from mental health-related conditions (Australian Institute of Health and Welfare, 2013a). Indigenous Australians living in NSW, Qld, WA, SA and the NT were 1.5 times as likely as non-Indigenous Australians to die from mental and behavioural disorders in 2006–2010 (Australian Institute of Health and Welfare, 2013a). 11 Deaths from mental and behavioural disorders do not include deaths from intentional self-harm (suicide). Intentional self-harm is coded under ICD-10-AM Chapter 19—Injury, poisoning and certain other consequences of external causes. Age-standardised death data demonstrated that Indigenous males (49 per 100,000 population) were 1.7 times as likely as non-Indigenous males to die from mental and behavioural disorders. Indigenous females were 1.3 times as likely as non-Indigenous females to die from mental and behavioural disorders (Australian Institute of Health and Welfare, 2013a). The greater number of deaths from mental and behavioural disorders with age may also represent the impact of conditions associated with ageing, such as dementia. For example, in 2014, Indigenous Australians (50.7 per 100,000 population) in NSW, Qld, SA, WA and the NT were 1.1 times as likely as non-Indigenous Australians (45.3 per 100,000 population) to die from dementia (including Alzheimer disease) (Australian Bureau of Statistics, 2016a). 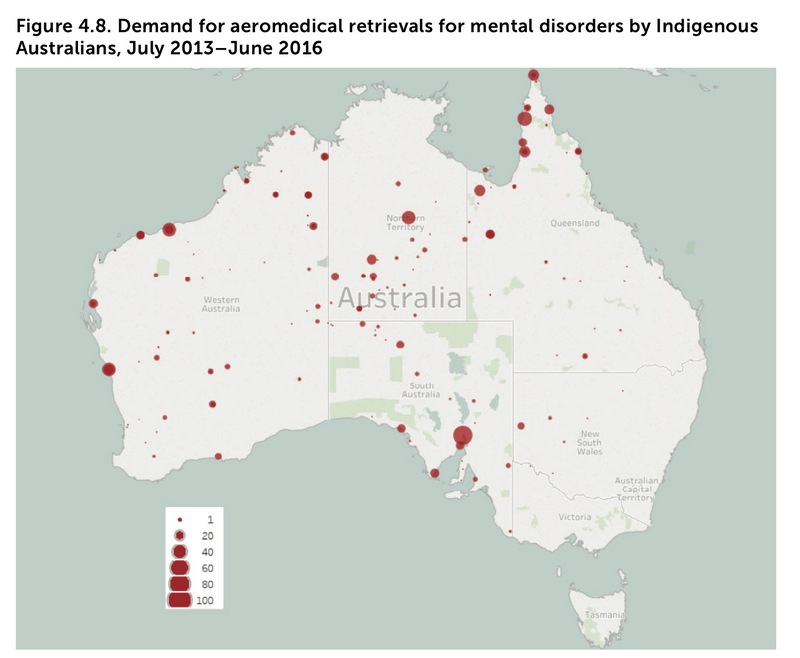 In 2014–2015, Indigenous Australians (28.3 per 1,000 population) were 1.7 times as likely as non-Indigenous Australians (16.3 per 1,000 population) to be hospitalised for mental and behavioural disorders (Australian Institute of Health and Welfare, 2016a). In 2011–2013, 4.2% of Indigenous hospitalisations were for mental and behavioural disorders (Australian Institute of Health and Welfare, 2015a). Age-standardised data demonstrated that Indigenous Australians (27.7 per 1,000 population) were twice as likely as non-Indigenous Australians (14.2 per 1,000 population) to be hospitalised for mental and behavioural disorders in 2011–2013 (Australian Institute of Health and Welfare, 2015a). In 2008–2009, Indigenous young people aged 12–24 years (2,535 per 100,000 population) were three times as likely to be hospitalised for mental and behavioural disorders than non-Indigenous young people (Australian Institute of Health and Welfare, 2011). The leading causes of hospitalisation for mental and behavioural disorders amongst Indigenous young people were schizophrenia (306 per 100,000 population), alcohol misuse (348 per 100,000 population) and reactions to severe stress (266 per 100,000 population) (Australian Institute of Health and Welfare, 2011). A preliminary clinical survey of 170 Aboriginal and Torres Strait Islander Australians in Cape York and the Torres Strait, aged 17–65 years, with a diagnosis of a psychotic disorder, was undertaken to describe the prevalence and characteristics of psychotic disorders in this population (Hunter, Gynther, Anderson, Onnis, Groves, & Nelson, 2011). Researchers found that: 62% of the sample had a diagnosis of schizophrenia, 24% had substance-related psychoses, 8% had affective psychoses, 3% had organic psychoses and 3% had brief reactive psychoses; Indigenous Australians aged 30–39 years were overrepresented in the psychosis sample compared to their representation in the population (37% of sample versus 29% of population) with slightly lower proportions in the 15–29 years and 40 years and older age groups; almost three-quarters (73%) of the sample were male (versus 51% for the Indigenous population as a whole); Aboriginal males (63% in the sample compared to 46% for the region as a whole) were overrepresented; a higher proportion of males (42%) than females (5%), and Aboriginal (44%) than Torres Strait Islander patients (10%) had a lifetime history of incarceration; comorbid intellectual disability was identified for 27% of patients, with a higher proportion for males compared to females (29% versus 20%) and Aboriginal compared to Torres Strait Islander patients (38% versus 7%); and alcohol misuse (47%) and cannabis use (52%) were believed to have had a major role in the onset of psychosis (Hunter et al., 2011). In 2015, Indigenous Australians (25.5 deaths per 100,000 population) in Qld, SA, NT, NSW and WA were twice as likely as non-Indigenous Australians (12.5 deaths per 100,000 population) to die from suicide (Australian Bureau of Statistics, 2016b). In their spatial analysis of suicide, Cheung et al. (2012) concluded that higher rates of suicide in the NT and in some remote areas could be explained by the large numbers of Indigenous Australians living in these areas, who demonstrate higher levels of suicide compared with the general population. 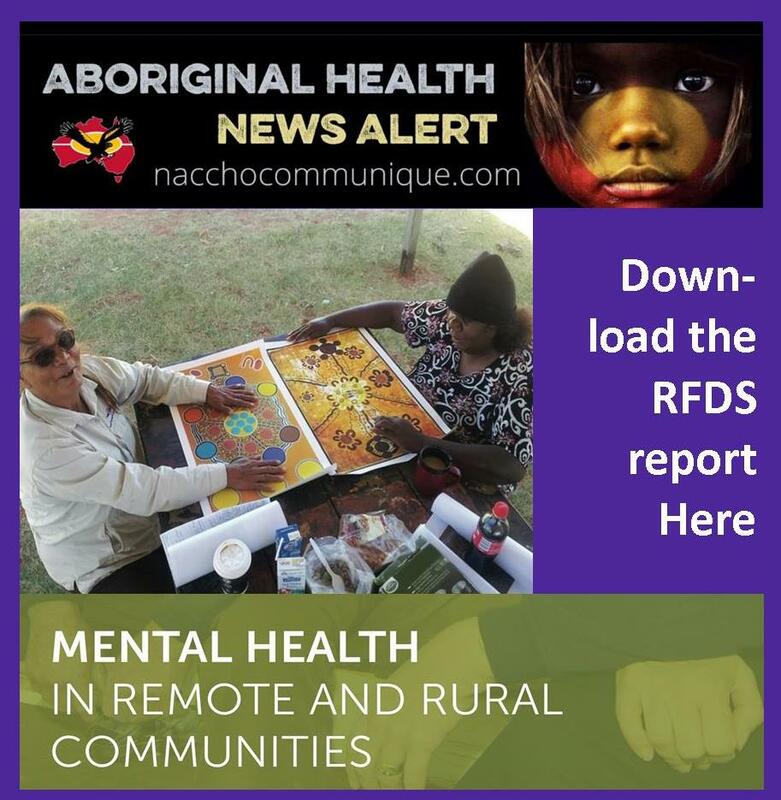 The poorer mental health of remote and rural Indigenous Australians is also impacted by the social determinants of Indigenous health, which are well recognised nationally and internationally. Like so many in the bush, Brendan Cullen has a lot on his plate. He manages a 40,000-hectare property south of Broken Hill. There are 8,000 sheep to keep track of. And that’s just a fraction of the number he looked after previously at another station. A few years ago, the mustering, the maintenance, juggling bills and family — it all caught up to him. “You just bottle stuff up. And sometimes you can’t find an out,” he said. He spent a lot of that time thinking about his problems. But Mr Cullen was lucky. He heard about a mental health clinic being run by the Royal Flying Doctor Service (RFDS) in a nearby community and decided to go along. “Catching up with one of the mental health nurses gave me the tools to be able to work out how I go about living a day-to-day life,” he said. 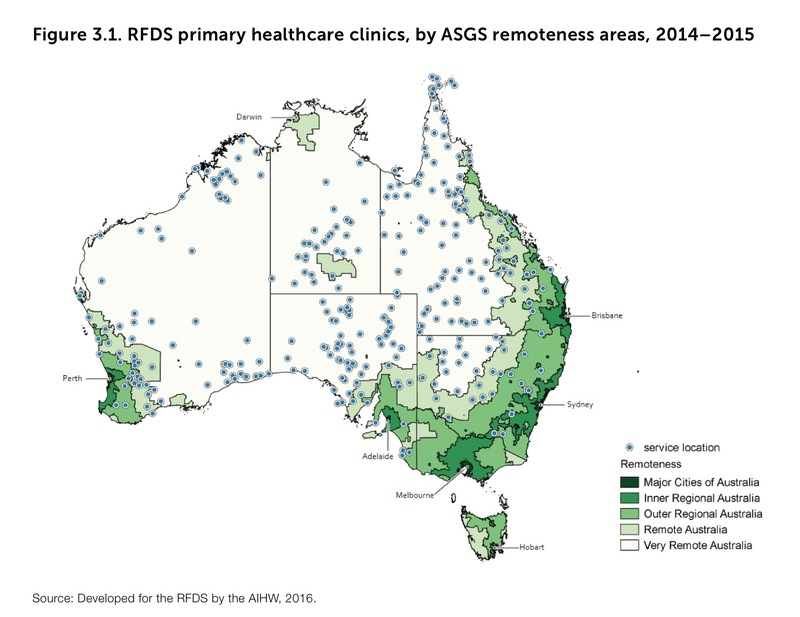 Mental health disorders are not more common in rural and regional Australia than they are in Australia’s cities, according to a new report from the RFDS, but they are a lot harder to treat. “People who live in the country get less access to care. And they become sicker,” RFDS CEO Martin Laverty said. To increase the access to care, the RFDS said it needed a massive increase in funding. “Country Australians see mental health professionals at only a fifth the rate of those who live in the city,” Mr Laverty said. The impact of distance and isolation when it comes to treating mental disorders can be seen in suicide rates. In remote Australia, the rate is nearly twice what it is in major metropolitan areas — 19.6 deaths per 100,000 people. The suicide rate is even greater in very remote communities. The RFDS has responded by increasing its mental health outreach. In communities like Menindee, about an hour’s drive from Broken Hill in the far west of New South Wales, a mental health nurse is on call once a fortnight. “I have needed them in the past. I got down to rock bottom at one stage. Even now I appreciate that support,” Menindee resident Margot Muscat said. Ms Muscat plays an active role in the remote community. But she has also felt pressure in the past to manage that role, her work, and family commitments. Mental health counselling has given her a valuable outlet. “Just to know that I wasn’t alone. And that you don’t have to take the drastic step of suiciding, so to speak,” Ms Muscat said. Some the RFDS’s mental health counselling is done over the airwaves. 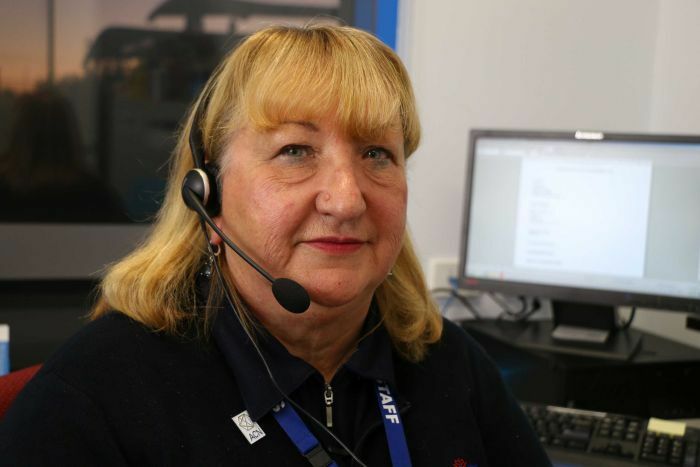 From its regional base in Broken Hill, mental health nurse Glynis Thorp counsels patients over the phone. Often calls are simply people checking in. “It’s critically important…often there might only be two people on the property. So no one to talk to maybe,” she said. The RFDS report reveals every year hundreds of serious mental illness incidents require airplanes to be dispatched to remote areas to fly patients out for treatment. 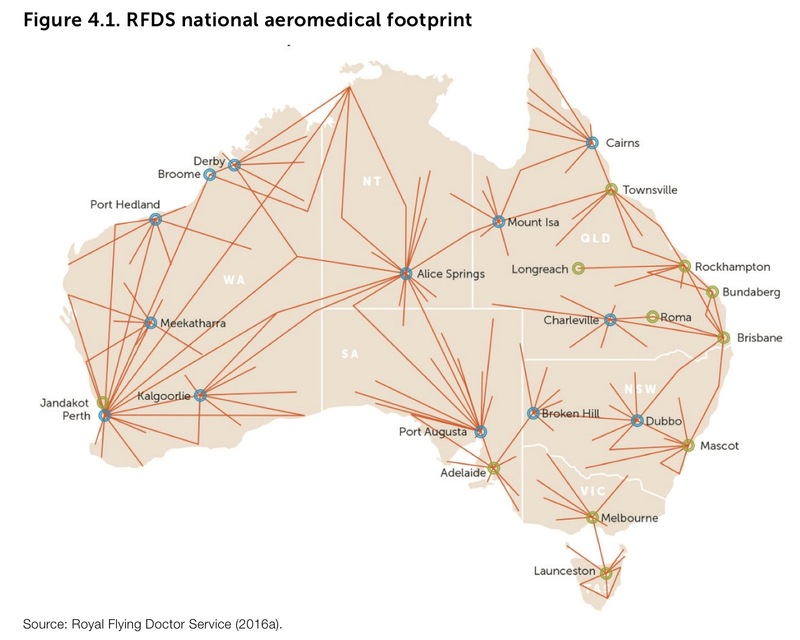 Over three years from July 2013 the RFDS conducted 2,567 ‘aeromedical retrievals’. The RFDS also uses airplanes to carry its mental health nurses to very remote areas. 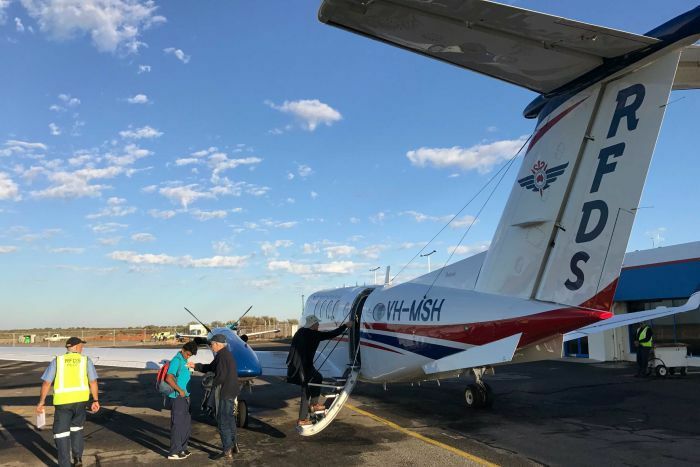 On a typical day in Broken Hill, the medical team takes off just after dawn to head to three communities hundreds of kilometres away: Wilcania, White Cliffs and Tilpa. In the opal mining town of White Cliffs, the mental health nurse sees patients at the local clinic. One is “Jane”, who doesn’t want her full name used. “Without them, we would really be lost here,” she said. Jane has been counselled by the RFDS and was recently directed to mental health treatment in Broken Hill. But she’s still reluctant to talk openly in town about the help she’s getting. Back on his station south of Broken Hill, Mr Cullen believes that stigma over mental health is slowly changing in the bush. “People get wind that someone’s had a mental health problem, people talk now. As opposed to, let’s go back five years even, 10 years. It was a closed book,” he said. “With these clinics, once upon a time you might have had a dental nurse, a doctor, and the like. 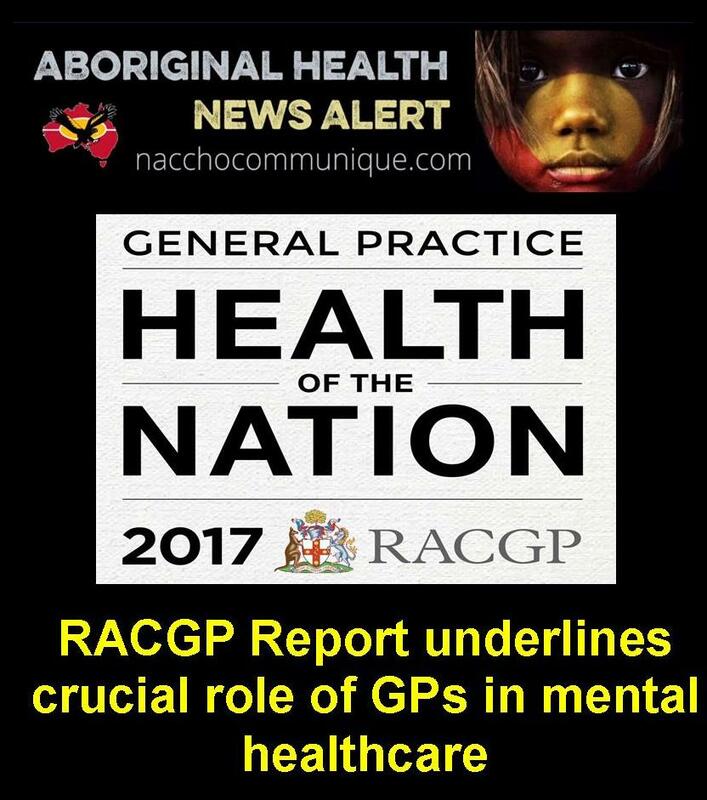 “Clearly Australia’s mental health system is failing Aboriginal people, with Aboriginal communities devastated by high rates of suicide and poorer mental health outcomes. 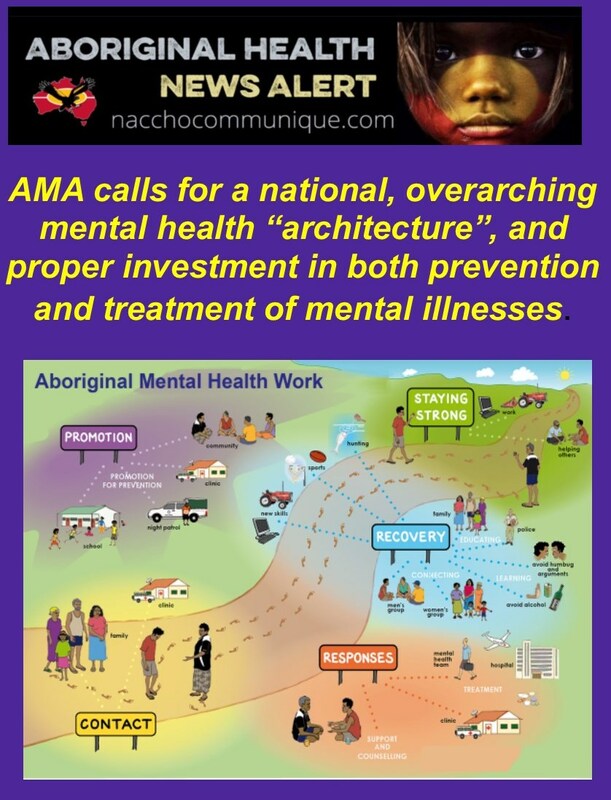 Poor mental health in Aboriginal communities often stems from historic dispossession, racism and a poor sense of connection to self and community. It is compounded by people’s lack of access to meaningful and ongoing education and employment. ” Mental illness affects one in five Australians and today World Mental Health Day – Monday 10 October – Mental Health Australia is encouraging all Australians to make a personal promise to improve their own mental health. It doesn’t have to be New Year to make a resolution, and making a promise is an active step in improving mental health and wellbeing. 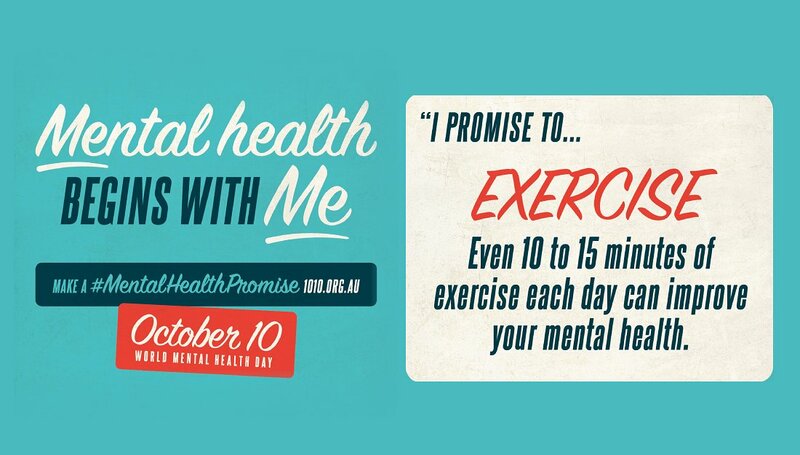 To get involved ahead of World Mental Health Day this year, and play an active role in your own mental health, make a #MentalHealthPromise at www.1010.org.au. Promise to sleep well, promise to eat well, promise to plan, to tune in, or tune out. Promise to cut back, or switch off, promise to engage with others, promise to exercise, to talk or to seek help… Making a promise can be a positive first step towards improved mental health. Mental Health Australia CEO Frank Quinlan, says the idea of making a promise reminds people that looking after their mental health is personal, and that it starts with them. “The promise campaign has really captured people’s interest in recent years, and to see thousands of people post their promises on our 1010.org.au website and social media feeds, is a real step in helping improve one’s mental health,” said Mr Quinlan. World Mental Health Day raises public awareness about mental health issues. The day promotes open discussion of mental disorders, and investments in prevention, promotion and treatment services. 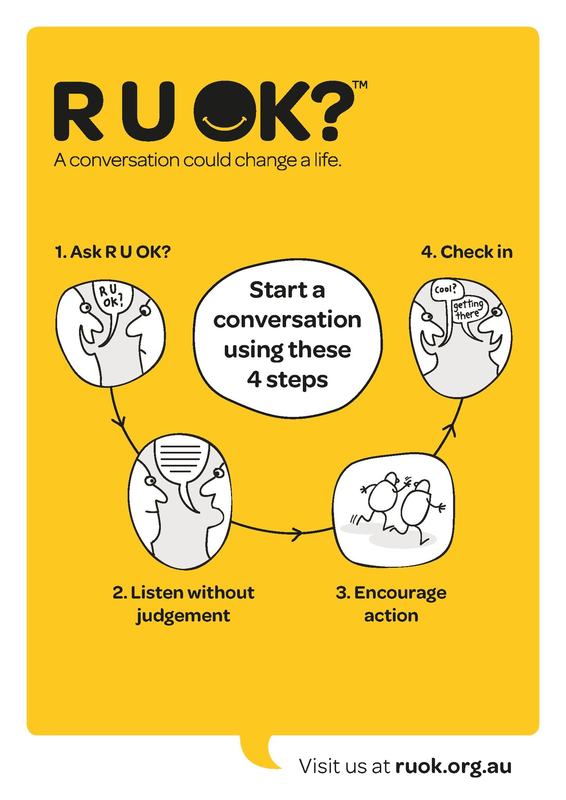 NACCHO Aboriginal #RUOKDay Mental Health : A conversation could save a life . Apunipima Indigenous Basketball All Star Aaron Bin Tahal is asking people to check in with their friends and family this RUOK? Day (8 September). Joe is a proud Wiradjuri, 1st Nations Aboriginal man born in Cowra, Apart from being involved with professional sport for over 15 years, Joe spends his time working to inspire youth through motivational speaking workshops. He has worked with disengaged youth in primary and secondary schools, drug and alcohol rehabilitation centres and gaols. This year the R U OK? organisation is laudably focusing more on the skills you need to connect and stay connected with someone you suspect is struggling. The website http://www.ruok.org.au has hints about how to talk to someone who says “No, I am not OK”. R U OK? general manager Brendan Maher. What will you do when you ask R U OK? and the answer is “no”? Be prepared, by becoming an “accidental counsellor”. 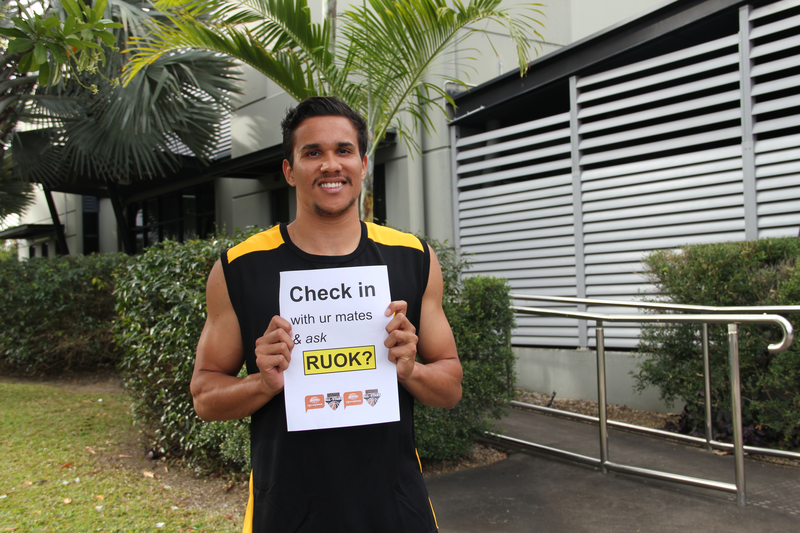 Aaron, a guard with Queensland Basketball League champions the Cairns Marlins, has put up his hand to be an RUOK? Ambassador in an effort to support people to reach in, and reach out when they need to. ‘Staying connected and having meaningful conversations is something we can all do,’ said RUOK? Campaign Director Rebecca Lewis. RUOK? 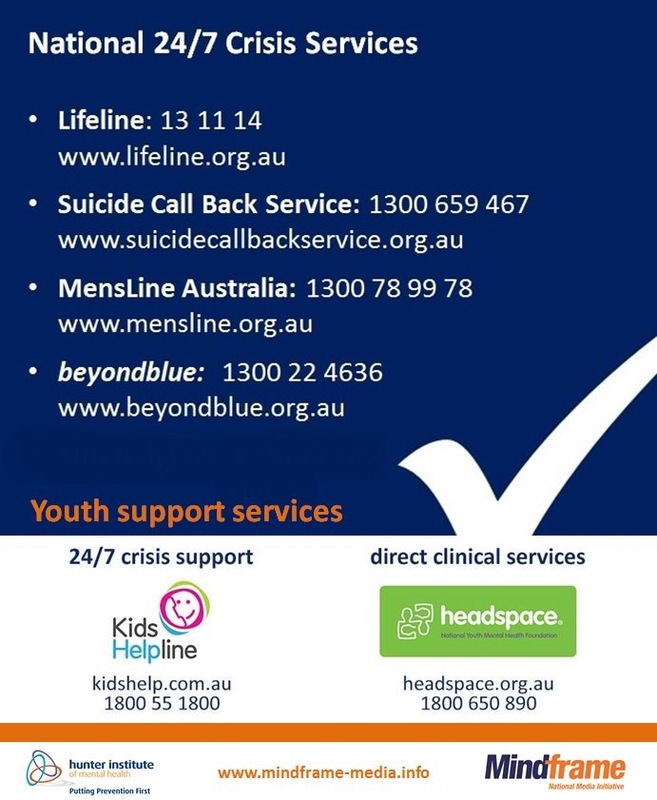 – a national suicide prevention campaign – is particularly relevant to the Aboriginal and Torres Strait Islander community: young Indigenous men aged 25-29 have the highest suicide rate in the world. Aaron, a Torres Strait Islander, said he hopes his role as an Ambassador will inspire other young Aboriginal and Torres Strait Islanders to check in with friends and family. Apunipima Social and Emotional Wellbeing Manager Bernard David said checking in could make all the difference. What will you do when you ask R U OK? and the answer is “no”? Be prepared, by becoming an “accidental counsellor”. On today hundreds of thousands of Australians will connect with a loved one, friend, colleague or even a long-lost mate by asking a simple question: R U OK? For eight years this great initiative has helped many people struggling with life’s problems or living with mental health issues. Asking about suicide is one of the most difficult but important skills anyone can learn. Everyone should ask R U OK? – or even better, ask something more, all year round, whenever your gut instinct tells you someone needs help. But what if you ask R U OK? and the person answers, “Yeah, I’m OK”? They might be, but they might not be, either. They might simply be too embarrassed or overwhelmed to open up. That doubt – is the person really OK? – is one missing piece of the R U OK? initiative. One in five Australians lives with a mental illness each year. Sane Australia says about one in seven people with serious mental illness will die by suicide – that’s 15 times the suicide rate in the general population. Many other Australians suicide when in crisis over domestic violence, relationship problems, grief, alcohol/drug abuse, gambling or financial stress. 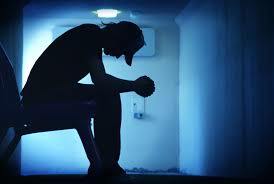 More than 2800 people die by suicide in Australia each year. That is about eight on R U OK?Day and a further eight on every single day this and every year. We need to do more to save lives – and we can. R U OK? is only the start of the conversation that can save many of those people and their families by giving them help and reasons to live. “A frustration I hear when talking to people is they don’t know what to do if the person answers, ‘No, I’m not OK’,” says R U OK? general manager Brendan Maher. This year the R U OK? organisation is laudably focusing more on the skills you need to connect and stay connected with someone you suspect is struggling. The website http://www.ruok.org.au has hints about how to talk to someone who says “No, I am not OK”. But it takes real skill to identify and talk to someone who is struggling so much that he or she is at significant risk of suicide. A disclosure here: I volunteer as a Lifeline telephone crisis supporter. Like thousands of colleagues across the nation, I answer calls from people who ring Lifeline on 13 11 14 when they are in crisis. Sometimes it’s about mental health but most critically it’s when suicide is possible. Lifeline crisis supporters undertake many hours of training. They take hundreds of calls. They constantly upgrade their skills. When someone is in crisis, calling Lifeline or similar crisis lines manned by trained supporters provides a strong opportunity to keep the person safe until the immediate crisis is relieved and longer term support found. But when you ask a friend or workmate R U OK? and get the answer “No”, the person may be in dire need then and there. What skills do you have to save that person? That’s fine, laudable and very worthwhile – as far as it goes. But every Australian is capable of learning simply, quickly and cheaply the key skills that will equip them to prevent suicide, beyond asking R U OK? And if the answer is yes to suicide, you need to know how to ask whether the person has an idea about where and how they might do it. And you need to know how to help disable their plan so further help can be found. Research shows that talking and asking about suicide will not put the thought into someone’s head. It will, in the vast majority of cases, make the person in crisis recognise that you care, there is hope and there is help. Lifeline runs the courses for companies, clubs, groups and schools, as well as individuals. If “accidental counsellors” spread the word and their skills through every community in Australia, hundreds of suicides will be prevented each year. To mark this R U OK?Day and World Suicide Prevention Day on Saturday, please connect with a loved one. But also take the next step. Find the missing piece in suicide prevention. Become an accidental counsellor. Today is R U OK? Day – a day to reach out to people you know, from family, to friends and work colleagues, to ask if they are okay. 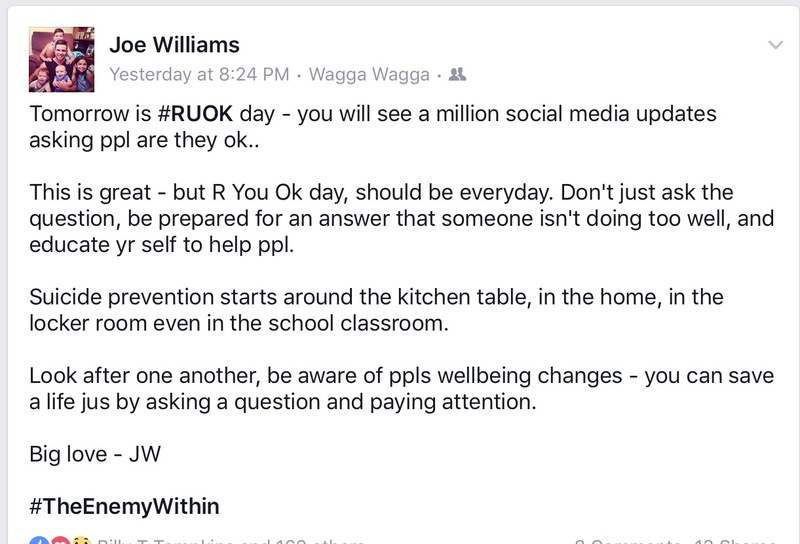 Minister for Indigenous Affairs, Nigel Scullion, who is a Conversation Hero with the R U OK? organisation, said that having a simple conversation with someone could help to prevent a small problem from becoming a bigger one. Minister Scullion said suicide rates were twice as high for Aboriginal and Torres Strait Islander people as for non-Indigenous Australians, with the highest rates occurring before the age of 40. “Every suicide is an absolute tragedy and it breaks my heart that so many Aboriginal and Torres Strait Islander families and communities live with this terrible pain,” Minister Scullion said. Today is also a reminder of why the Coalition Government made an election commitment to roll out Indigenous Mental Health First Aid training to remote communities. “The Indigenous Mental Health First Aid training that we are rolling out will help communities identify the early warning signs of mental health issues in their friends and families and equip people with the knowledge and training about how best to help,” Minister Scullion said. Chair of the UN Permanent Forum on Indigenous Issues. Indigenous peoples must not be left out of the global community’s unfolding sustainable development agenda, United Nations Secretary-General Ban Ki-moon affirmed as he marked the 2015 edition of the International Day of the World’s Indigenous Peoples with a focus on their lagging access to health care services around the world. “They count among the world’s most vulnerable and marginalized people. Yet their history, traditions, languages and knowledge are part of the very bedrock of human heritage,” the Secretary-General declared in remarks delivered at an event held at a special UN Headquarters in New York. The event was also expected to hear remarks from Wu Hongbo, Under-Secretary-General for Economic and Social Affairs, and Megan Davis, Chair of the UN Permanent Forum on Indigenous Issues. “Indigenous peoples can teach the world about sustainable lifestyles and living in harmony with nature,” he added. The International Day of the World’s Indigenous Peoples is commemorated annually on 9 August in recognition of the first meeting of the UN Working Group on Indigenous Populations, held in Geneva in 1982. This year, the Day’s theme focuses the spotlight on promoting the health and well-being of the world’s indigenous peoples through the 2030 Sustainable Development Agenda, which will be launched in September. The new agenda expands on the success of the Millennium Development Goals (MDGs), which had a target date of 2015, and contains 17 sustainable development goals. Today’s event also saw the launch of the UN’s latest State of the World’s Indigenous Peoples State of the World’s Indigenous Peoples report which examines the major challenges indigenous peoples face in terms of adequate access to and utilization of quality health care services. According to the UN, there are an estimated 370 million indigenous people in some 90 countries around the world who constitute 15 per cent of the world’s poor and about one third of the world’s 900 million extremely poor rural people. Practicing unique traditions, they retain social, cultural, economic and political characteristics that are distinct from those of the dominant societies in which they live. At the same time, the unique placement of indigenous peoples in society puts them at a disadvantage when seeking access to healthcare while also rendering them more susceptible to specific forms of illness. The UN chief noted, in fact, that indigenous peoples regularly encounter inadequate sanitation and housing, lack of prenatal care and widespread violence against women as well as enduring high rates of diabetes, drug and alcohol abuse, youth suicide and infant mortality. In Australia, he warned, many Aboriginal communities have a diabetes rate six times higher than the general population. Meanwhile, in Rwanda, Twa households remain seven times more likely to have poor sanitation and twice as likely to lack safe drinking water. Similarly, in Viet Nam, more than 60 per cent of childbirths among ethnic minorities take place without prenatal care while for the majority population, the figure hovers closer to 30 per cent. 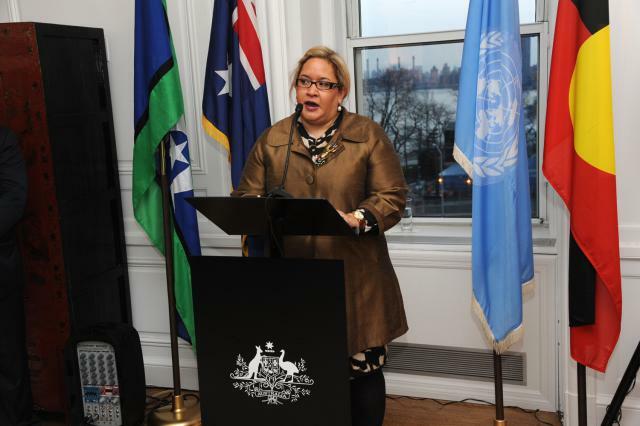 In her remarks, Ms. Davis said the active and ongoing involvement of indigenous peoples in the development, implementation, and management and monitoring of policies, services and programs affecting the well-being of their communities is essential. “Only by acknowledging the interrelationship between health and the social determinants of health, such as poverty, illiteracy, marginalization, the impact of extractive industries, environmental degradation, and the lack of self-determination, will any new human development goals be truly achievable amongst indigenous peoples,” she said. The current MDGs have, Ms. Davis continued, failed to identify the relationship (or access) to customary land as an indicator of well-being. Similarly, mental health issues such as depression, substance abuse and suicide will not be completely addressed so long as the harms of colonization and the status of indigenous peoples are not acknowledged. “Thus, on the eve of the adoption of a new development agenda, new indicators of indigenous peoples’ health and well-being must be defined in consultation with indigenous peoples. Similarly, States should seriously engage in the disaggregation of data in order to better inform the effectiveness of their health policies and plans for indigenous peoples,” she said. This analysis looks at the Indigenous provisions in the 2015-16 federal Budget. This is done in the light of current and past strategies, policies, programs and funding, and is supported, where this is possible, by data and information drawn from government agencies, reports and published papers. Similar analyses from previous budgets are available on the University of Sydney e‐scholarship website. The opinions expressed are solely those of the author who takes responsibility for them and for any inadvertent errors. The 2015-16 Budget from the Abbott Government has no major announcements on Indigenous issues, and they did not rate a mention in the Treasurer’s budget night speech. However the Budget is far from benign in its support for Indigenous programs and advocacy groups say it has failed to undo the damage done and anxiety caused by funding cuts in last year’s Budget. Many programs and services must continue to operate with uncertain funding into the future and in the absence of clear strategies and policies from the Abbott Government. This comes on top of the threat of remote community closures in Western Australia, attempts to weaken protection from racial vilification under the Racial Discrimination Act, and concerns about the implementation of and outcomes from the Indigenous Advancement Strategy (IAS) tendering process. Indigenous organisations are losing out in the competition for funds to deliver Indigenous programs and services and after last year’s Budget cuts, there is no new funding for key representative groups such as the National Congress of Australia’s First Peoples. Despite the need and the promises, Commonwealth funding for Indigenous Affairs as a percentage of both total outlays and GDP is in decline. And it is disconcerting to see Indigenous voices and input into decision-making being side-lined. Indigenous groups and spokespeople have called the government on the absence of real engagement and consultation – something which has long been recognised as the key to failure or success in Indigenous affairs. In March 2015 the Minister for Indigenous Affairs, Nigel Scullion, took delivery of ‘The Empowered Communities Report’, produced of a group of Indigenous leaders from across Australia brought together by the Jawun Indigenous Partnerships Corporation. The report outlined ways for Indigenous communities and governments to work together to set priorities and streamline services at a regional level, in line with the Government’s approach. The Minister committed that the Government would consider carefully the report’s recommendations and respond ‘in due course’. That has yet to happen. What emerges most strikingly from this year’s Budget analysis is that little has been done over the past twelve months to assess the implications of commissioned reports and reviews, to capitalise on the restructure and realignment of Indigenous programs, to develop promised new policies and to roll them out. All that has been done to date is to shift responsibility for programs to the Department of Prime Minister and Cabinet and to rebrand programs that may or may not be effective. It’s a policy-free zone, where ad hoc decisions are the norm and budgets continue to be constrained in ways that limit the effectiveness and reach of programs and services. There are a number of examples where program funding has been provided at the expense of other needed programs – taking $11.5 million from Indigenous Safety and Wellbeing programs to reverse funding cuts to the Indigenous Legal Assistance Program is perhaps the most egregious example. There are also concerns that proposed changes to mainstream programs such as increased co-payments and safety net threshold in health, reduced Commonwealth funding for public hospitals, increased costs for higher education, and changes to the collection of census data will have a disproportionate impact on Indigenous Australians. Small wonder then that most Closing the Gap targets remain out of reach and the sector is struggling to keep programs functioning and retain staff. The inequality gap between Indigenous peoples and other Australians remains wide and has not been progressively reduced. With a significant proportion of Indigenous Australians in younger age groups, and without funded commitments to actions now and into the next several decades to improve their socio-economic status, future demands for services will burgeon. The National Aboriginal and Torres Strait Islander Health Plan 2013-2023 was developed to provide an overarching framework which builds links with other major Commonwealth health activities and identifies areas of focus to guide future investment and effort in relation to improving Indigenous health. On 30 May 2014 the Assistant Minister for Health, Fiona Nash, announced that an Implementation Plan would be developed for this Health Plan. This was supposed to be available from 1 July 2015 to enable the progressive implementation of the new funding approach for the Indigenous Australian’s Health Program. The new approach will target funds to those regions whose populations experience high health need and population growth. The Budget Papers explicitly mention NACCHO as the nominated community stakeholders along with States/Territories in the development of this mechanism. At June 2015 Senate Estimates PM&C officials said that the implementation plan was still being developed by DoH in collaboration with the National Health Leadership Forum, AIHW and PM&C. Its release was expected within a ‘short period of time’. Ensure the development and implementation of the National Strategic Framework for Aboriginal and Torres Strait Islander Peoples’ Mental Health and Wellbeing 2014-2019 as a dedicated mental health plan for Aboriginal and Torres Strait Islander peoples, and in coordination with the implementation of the National Aboriginal and Torres Strait Islander Suicide Prevention Strategy and the National Aboriginal and Torres Strait Islander Drug Strategy. Establish partnership arrangements between the Australian Government and state and territory governments and between ACCHS and mainstream services providers at the regional level for the delivery of appropriate health services. The Health Portfolio Budget Statement says that in n 2015-16, the Government will implement a National Continuous Quality Improvement Framework for Indigenous primary health care through the expansion of the Healthy for Life activity. This will support the delivery of guideline-based primary health care and support improved health outcomes. There were no specific Indigenous issues included in the Health budget, and there are questions about the future of some programs. 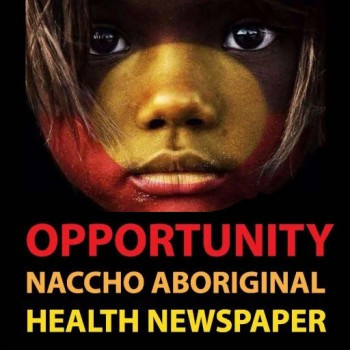 The Abbott Government has provided $1.4 billion /3 years ($448 million / per year) for Aboriginal Community Controlled Health Organisations (ACCHOs). This will include a 1.5% CPI increase over the 3 year period. 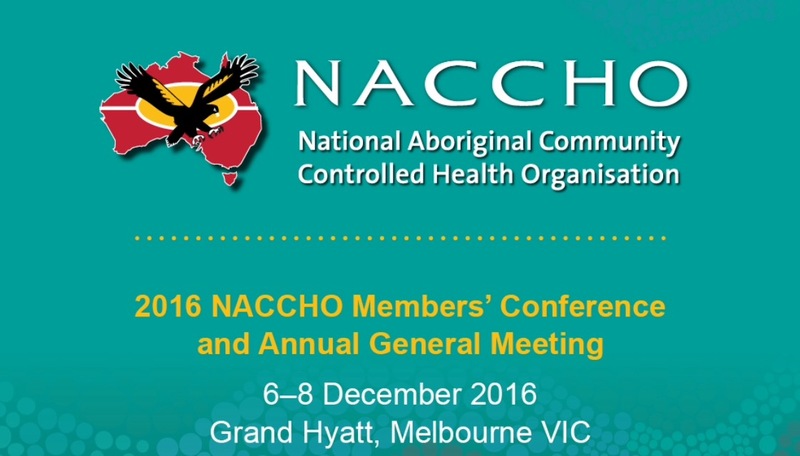 NACCHO and Affiliate funding of $18 million is provided for 18 months and in that time DoH will commence a review of NACCHO’s role and function. 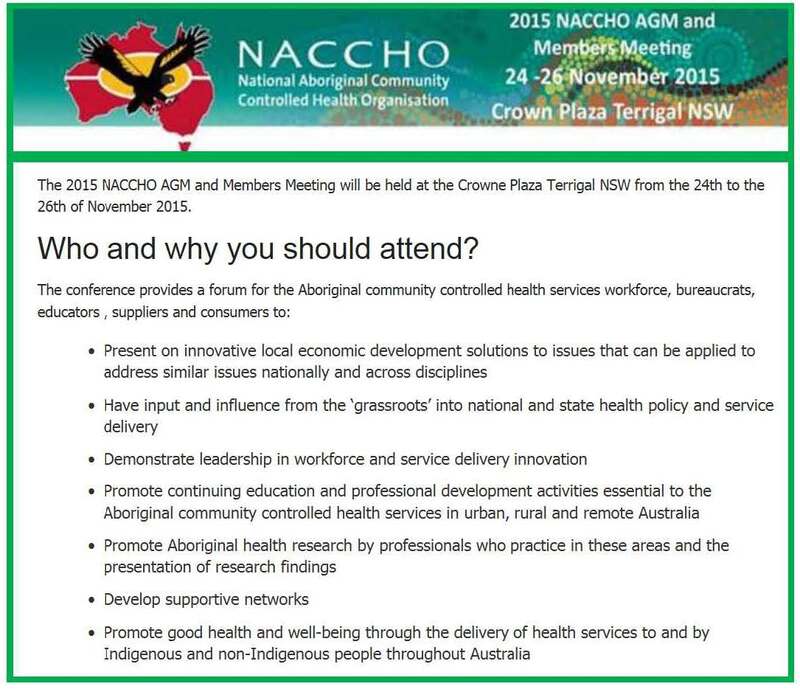 In addition, NACCHO has secured confirmation of an extension of the exemption from Section 19.2 of the Health Insurance Act 1973 which expires on 30 June 2015, which enables ACCHOs to receive financial benefit from Medicare rebates in addition to Government funding. This extension will be granted until June 2018. The freeze on MBS rebate indexation will have a significant financial impact on ACCHOs as will any increase in Medicare and PBS co-payments. In combination the 2014-15 and 2015-16 Budgets will cut $500 million / 4 years from 14 of the 16 DoH flexible funds. There is still no clarity in relation to how these savings are to be achieved, although the Aboriginal and Torres Strait Islander Chronic Disease Fund will not be cut. However cuts to other funds such as those that support the provision of essential services in rural, regional and remote Australia, that manage responses to communicable diseases and that deliver delivering substance abuse treatment services will affect Indigenous Australians. Fixing the gaps and improving the patient journey. The Fund was established in the 2011 Budget and came into operation on 1 July 2011. The funding is $833.27 million / 4 years (from 1 July 2011 to 30 June 2015). The majority of funding has been directly allocated to organisations to support activities under the Fund’s Indigenous Chronic Disease Package programs. At June 2015 Senate Estimates it was confirmed that most, but not all, of the activities under this fund were continuing. Local community campaigns and the chronic disease self-management program were named as two programs that were not continued. The 2014-15 Budget cut $130 million / 5 years from the Tackling Indigenous Smoking Program, despite the fact that 44% of Indigenous people smoke. The program was reviewed in 2014 and the DoH website says that this review will “provide the Government with options to ensure the program is being implemented efficiently and in line with the best available evidence. The outcome of the review will inform new funding arrangements from 1 July 2015.” However there were no announcements in the Budget. The redesigned program was announced on 29 May 2015, but with no increase in funding It is not clear when or if the review of this program, conducted by the University of Canberra, will be released. Funding in 2014-15 was $46.4 million; this is reduced to $35.3 million in 2015-16. Staffing levels have also fallen significantly, from 284 FTEs in May 2014 to 194 FTEs in May 2015. There will be further disruption to this important program as current contracts cease at the end of June 2015 and the 49 organisations that deliver the program must go through the IAS Invitation to Apply Process for further funding. Transitional funding will be available for the next 6 months. $54 million expansion, from 2015-16, of New Directions from 85 to 137 sites (52 additional sites overall) to ensure more Indigenous children are able to access effective child and maternal health programs. $40 million expansion, from 2015-16, of the Australian Nurse Family Partnership Program from 3 to 13 sites (10 additional sites overall) to provide targeted support to high needs Indigenous families in areas of identified need. The Budget provides for the listing of Zostavax vaccine for the prevention of shingles to be listed on the National Immunisation Program for 70 year olds from 1 November 2016. This measure includes a 5-years program to provide a catch-up program for people aged 71-79. There is concern that the 70-79 year old age cohort largely excludes Indigenous people because of their lower life expectancy. This is an ongoing measure and although it was not mentioned in the Budget, it was stated in Senate Estimates that this would continue as currently. The QUMAX program is a quality use of medicines initiative that aims to improve health outcomes for Indigenous people through a range of services provided by participating ACCHO and community pharmacies in rural and urban Australia. It commenced in 2008 as a two year pilot. It was later approved for a transition year outside the 4th Community Pharmacy Agreement and for a further four years under the 5th Community Pharmacy Agreement. NACCHO and the Pharmacy Guild of Australia have been negotiating 1 year transition funding of QUMAX to enable development of an Implementation Plan under the 6th Community Pharmacy Agreement. NACCHO will seek to expand QUMAX from 76 services to 134 services. This is an ongoing program (although it may be subject to an indexation freeze). It is expected to be considered as part of the new MBS Review. The Budget cut Medicare funding for the Healthy Kids Check, a consultation with a nurse or GP to assess a child’s health and development before they start school, on the basis that this measure is a duplication with existing State and Territory based programs. NACCHO states that this change will not impact ACCHOs or Indigenous children as ACCHOs can continue to bill health assessments through a separate item (MBS item 715). The current transition of Medicare Locals (MLs) to Primary Health Networks (PHNs) is proceeding slowly and many details relating to specific programs remain unknown, perhaps even undecided. To date, 21 of 61 MLs outsource the provision of services for Indigenous Australians directly to ACCHOs. The provision of these services will now move to a competitive commissioning process, leading to concerns about issues such as cultural safety and sensitivity. The Minister for Health, Sussan Ley, has advised NACCHO that funding for Complementary Care and Supplementary Services will transition to the PHNs. The Budget has nothing that responds to the National Mental Health Commission’s review of programs and services. The report describes Indigenous mental health as ‘dire’. It’s a dominant over-arching theme throughout, and there is a recommendation to make Indigenous mental health a national priority and agree an additional COAG Closing the Gap target for mental health. Despite this, the Government has delayed any action and has established an Expert Reference Group to develop implementation strategies. There is no Indigenous representation on the Reference Group. Alcohol abuse has been identified as a major public health concern among Indigenous people, with serious physical and social consequences. Indigenous Australians between the ages of 35 and 54 are up to eight times more likely to die than their peers, with alcohol abuse the main culprit and alcohol is associated with 40% of male and 30% of female Indigenous suicides. Fewer Indigenous people drink alcohol than in the wider community, but those who do drink do so at levels harmful to their health. Culturally appropriate intervention approaches are needed and ‘dry zones’ are only seen as stop gap measures. Cuts made in Flexible Funds affect drug and alcohol programs. Professor Kate Conigrave reports that there are now only 5 dedicated Indigenous drug and alcohol services nationally. This Budget commits $20 million / 2 years for a new stage of the National Drugs Campaign primarily aimed at the use of ice. No consultation has been undertaken in the lead up to the announcement of this health promotion campaign. It almost certainly will not achieve tangible outcomes for Aboriginal people, despite concerns about a growing ice epidemic in remote Indigenous communities. 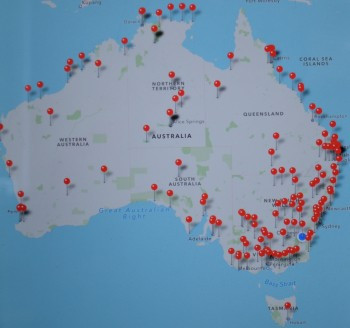 There are 123 petrol stations selling Opal fuel in remote parts of Australia but some retailers in the roll-out zones don’t and there are pockets of sniffing near state borders. In December 2014 it was announced that a bulk storage tank for low-aromatic unleaded fuel (LAF or Opal ) is to be installed in northern Australia as part of the roll-out of OPAL in the fight to curb the problem of petrol sniffing. 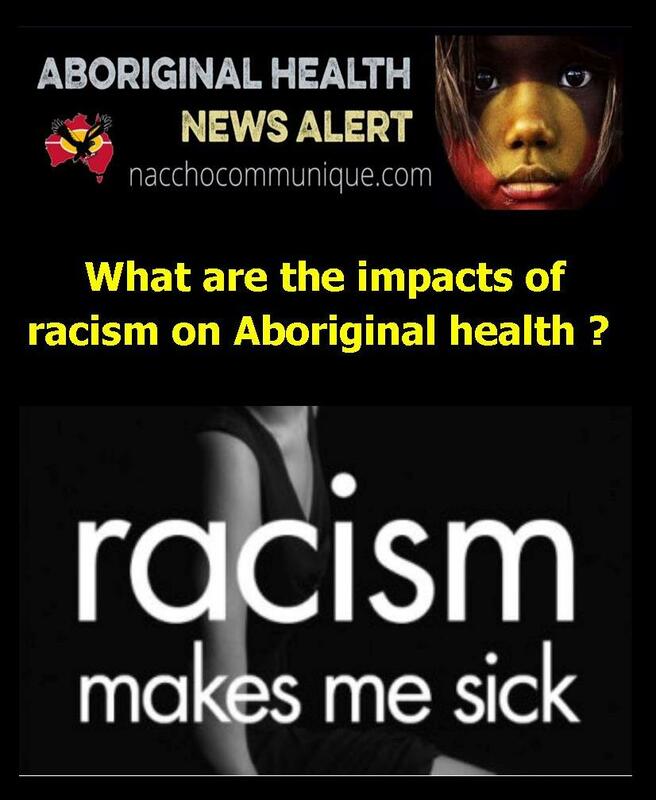 NACCHO Aboriginal health and racism : What are the impacts of racism on Aboriginal health ? “On an individual level, exposure to racism is associated with psychological distress, depression, poor quality of life, and substance misuse, all of which contribute significantly to the overall ill-health experienced by Aboriginal and Torres Strait Islander people. It’s well known that Indigenous Australians have much lower life expectancy than other Australians, and have disproportionately high rates of diseases and other health problems. Could that in part be due to racism? Would cultural awareness training for health professionals would reduce the incidence of racism ? Should governments acknowledge and address the impact of factors such as racism on health outcomes? These are some of the question being asked in the health and community sectors, amid reports of a rise in racist incidents. The Social Determinants of Health Alliance is a group of Australian health, social services and public policy organisations. It lobbies for action to reduce inequalities in the outcomes from health service delivery. Chair of the Alliance, Martin Laverty, has no doubt racism sometimes comes into play when Indigenous Australians seek medical attention. Romlie Mokak is the chief executive of the Australian Indigenous Doctors’ Association. Mr Mokak says the burden of ill health is already greater amongst Indigenous people – but this isn’t recognised when they go to access health services. Mr Mokak says many Indigenous people are victims of prejudice when seeking medical services. But Romlie Mokak from the Australian Indigenous Doctors Association says the onus shouldn’t be on the federal government alone to improve the situation. He suggests cultural awareness training for health professionals would reduce the incidence of racism. Martin Laverty says at a recent conference, data was presented suggesting an increase in the number of Australians experiencing racism. And he says one of the results is an increase in psychological illnesses. Mr Laverty says it’s time governments acknowledged and addressed the impact of factors such as racism on health outcomes. He says a good start would be to implement the findings of a Senate inquiry into the social determinants of health, released last year. On an individual level, exposure to racism is associated with psychological distress, depression, poor quality of life, and substance misuse, all of which contribute significantly to the overall ill-health experienced by Aboriginal and Torres Strait Islander people. Prolonged experience of stress can also have physical health effects, such as on the immune, endocrine and cardiovascular systems. In July 2013, the former federal government launched its new National Aboriginal and Torres Strait Islander Health Plan. As with all such plans, much depends on how it is implemented. With the details of how it is to be turned into meaningful action yet to be worked out, many Aboriginal and Torres Strait Islander people, communities and organisations and others will be reserving their judgment. Nevertheless, there is one area in which this plan breaks new ground, and that is its identification of racism as a key driver of ill-health. This may be surprising to many Australians. The common perception seems to be that racism directed towards Aboriginal and Torres Strait Islander people is regrettable, but that such incidents are isolated, trivial and essentially harmless. Such views were commonly expressed, for example, following the racial abuse of Sydney Swans footballer Adam Goodes earlier this year. However, the new health plan has got it right on this point, and it is worth looking in more detail at how and why. So how common are racist behaviours, including speech, directed at Aboriginal and Torres Strait Islander people? A key study in Victoria in 2010-11, funded by the Lowitja Institute, documented very high levels of racism experienced by Aboriginal Victorians. It found that of the 755 Aboriginal Victorians surveyed, almost all (97 per cent) reported experiencing racism in the previous year. This included a range of behaviours from being called racist names, teased or hearing jokes or comments that stereotyped Aboriginal people (92 per cent); being sworn at, verbally abused or subjected to offensive gestures because of their race (84 per cent); being spat at, hit or threatened because of their race (67 per cent); to having their property vandalised because of race (54 per cent). Significantly, more than 70 per cent of those surveyed experienced eight or more such incidents in the previous 12 months. Other studies have found high levels of exposure to racist behaviours and language. Such statistics describe the reality of the lived experience of Aboriginal and Torres Strait Islander people. Most Australians would no doubt agree this level of racist abuse and violence is unwarranted and objectionable. It infringes upon our rights – not just our rights as indigenous people but also our legal rights as Australian citizens. But is it actually harmful? Is it a health issue? Studies in Australia echo findings from around the world that show the experience of racism is significantly related to poor physical and mental health. There are several ways in which racism has a negative effect on Aboriginal and Torres Strait Islander people’s health. First, on an individual level, exposure to racism is associated with psychological distress, depression, poor quality of life, and substance misuse, all of which contribute significantly to the overall ill-health experienced by Aboriginal and Torres Strait Islander people. Prolonged experience of stress can also have physical health effects, such as on the immune, endocrine and cardiovascular systems. 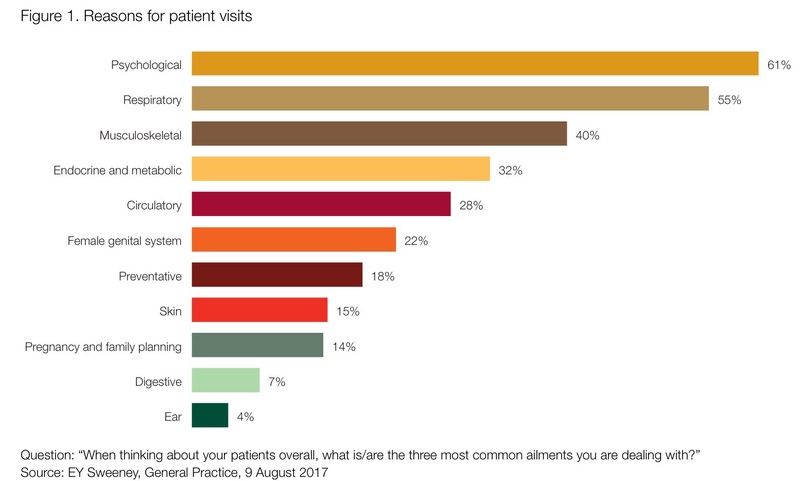 Second, Aboriginal and Torres Strait Islander people may be reluctant to seek much-needed health, housing, welfare or other services from providers they perceive to be unwelcoming or who they feel may hold negative stereotypes about them. Last, there is a growing body of evidence that the health system itself does not provide the same level of care to indigenous people as to other Australians. This systemic racism is not necessarily the result of individual ill-will by health practitioners, but a reflection of inappropriate assumptions made about the health or behaviour of people belonging to a particular group. What the research tells us, then, is that racism is not rare and it is not harmless: it is a deeply embedded pattern of events and behaviours that significantly contribute to the ill-health suffered by all Aboriginal and Torres Strait Islander Australians. Tackling these issues is not easy. The first step is for governments to understand racism does have an impact on our health and to take action accordingly. 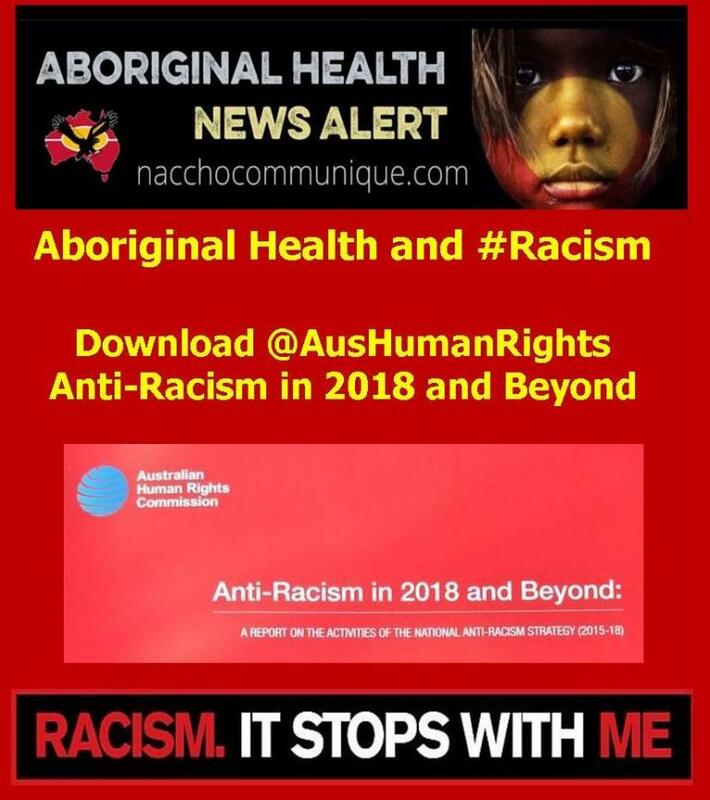 Tackling racism provides governments with an opportunity to make better progress on their commitments to Close the Gap, as the campaign is known, in Aboriginal and Torres Strait Islander health. The new plan has begun this process, but it needs to be backed up with evidence-based action. Second, as a nation we need to open up the debate about racism and its effects. The recognition of Aboriginal and Torres Strait Islander peoples in the Constitution is important for many reasons, not least because it could lead to improved stewardship and governance for Aboriginal and Torres Strait Islander health (as explored in a recent Lowitja Institute paper, “Legally Invisible”). However, the process around constitutional recognition provides us with an opportunity to have this difficult but necessary conversation about racism and the relationship between Australia’s First Peoples and those who have arrived in this country more recently. Needless to say, this conversation needs to be conducted respectfully, in a way that is based on the evidence and on respect for the diverse experiences of all Australians. Last, we need to educate all Australians, especially young people, that discriminatory remarks, however casual or apparently light-hearted or off-the-cuff, have implications for other people’s health. Whatever approaches we adopt, they must be based on the recognition that people cannot thrive if they are not connected. Aboriginal and Torres Strait Islander people need to be connected with their own families, communities and cultures. We must also feel connected to the rest of society. Racism cuts that connection. At the same time, racism cuts off all Australians from the unique insights and experiences that we, the nation’s First Peoples, have to offer. Seen this way, recognising and tackling racism is about creating a healthier, happier and better nation in which all can thrive. Pat Anderson is chairwoman of the Lowitja Institute, Australia’s National Institute for Aboriginal and Torres Strait Islander Health Research.